Hansbrough signed a reserve/future contract with the Redskins on Thursday, John Keim of ESPN.com reports. Analysis: Hansbrough did not sign with a team during the 2018 regular season but now joins Washington's 90-man roster. The 25-year-old has only played five special teams snaps in his NFL career and faces an uphill battle to secure a depth role with the Redskins this offseason. Hansbrough (undisclosed) was waived by the Chargers on Saturday, Ricky Henne of the team's official site reports. 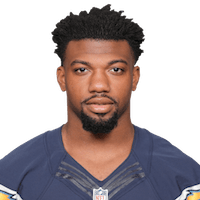 Analysis: Hansbrough failed to beat out Justin Jackson for the fourth spot at running back behind Melvin Gordon, Austin Ekeler and Detrez Newsome. Hansbrough has played just five special teams snaps in two games played during his NFL career. Hansbrough did not play in Saturday's preseason victory over the Seahawks due to an undisclosed injury, Chris Hayre of the Chargers' official site reports. Analysis: Hansbrough could be in danger of missing additional time in practice this week if the undisclosed injury lingers, while fellow backup running backs Austin Ekeler (calf) and Justin Jackson (hamstring) are also dealing with issues of their own. This leaves starter Melvin Gordon and Detrez Newsome as the lone options at full strength in the Chargers' backfield heading into Week 3 of the preseason. There are no videos available for Russell Hansbrough. Click here to view all videos.